In Cesson-Sévigné, close to Rennes, there is an odd kind of river; in fact it is an artificial white water centre which has been set up on a branch of the main river. This municipal centre is closely supervised with your safety in mind because they are able to control the flow and speed of the water. Kayaking, rafting, inflatable canoes are for hire and the activities available to children aged 8+. After a few explanations about the how to behave and understand the rules, anyone can try these wonderful leisure activities. A quick pre-cap: Kayaking/Canoeing, Cycle Hire, Numerous Cycle Trails, Marked walks, Golf, Swimming, Mini Golf, Tennis, Beaches, Cinema, Tree Top Adventure Park, Horse riding and horse racing and shows. For the more artistic guests there are workshops in pottery, glass painting and card making, etc. Plessala has numerous walks around the village as well as a lovely park with a lake, fitness trail and children's play area, mini golf and tennis. Fishing permits can also be bought at the Mairie in the village. Moncontour a ' Petite Cite de Caractere. This is a beautiful fully preserved fortified medieval town dating from the 11th Century. The town has many fetes including the bi-annual medieval festival and the 14th July celebrations and, on summer evenings the Ramparts are illuminated. There are also bars and resturants as well as an indoor swimming pool. There is a good mini Carrefour supermarket which is open until 8pm most nights and on Sunday mornings and the weekly market is held on a Saturday evening from 5 pm. Site de la Roche au Cerf – within is to the south of Plessala is a beautiful area with stepping stones across the River Lie. The area is popular with cyclists and walkers having many marked routes and deer are sometimes spotted taking an early morning drink. Kayaking/Canoeing and Cycle Hire at Plougenast during July and August. Plemet - Kayaking/Canoe hire and Mountain Bike hire available all year round. Lamballe - a lovely historical town with several bars and restaurants, featuring many half timbered houses, a museum and the Haras National, a large equestrian centre which runs tours and shows. Highly recommend is a visit Lamballe on a Thursday when it holds its large market from 7am until 2pm and in the summer months, there are extra shows at the Haras in the afternoon and guided walks to follow in the footsteps of Frederick the Great. To top it off on a summer's evening, in July and August, the town hosts a live music festival Thursday evenings with a very reasonable spitroast. During any visit to Lamballe, it is highly recommended that you lunch at La Terrasse restaurant in the square (very popular with locals) and enjoy a good plat du jour followed by the best and cheapest Cafe Gourmand around (expresso with a selection of mini puddings). For non-coffee drinkers or children why not try the “Chocolat Gourmand”. Just outside of Lamballe is a go karting centre where the owners speak English and are extremely friendly. There is also a golf course here. Jugon Les Lacs – A large lake which offers boating activities, sailing, windsurfing or just a pedaloe. It also has an outdoor heated swimming pool and you can hire bikes and follow one of the many cycle routes in the area. Chateau de la Hunaudaye – This is a beautiful example of medieval Breton architecture. Loudeac - Although, a modern town and not that exciting, it does boast a horseracing course (hippodrome) for ‘trotting’ which is a typical French sport and well worth being a spectator, as well as a cinema and an indoor pool complex with “flumes”. They have regular brocante sales at the race course. There is also a wonderful, very reasonably priced riding school ‘centre equestre’ where you can arrange a hack through the forest. The staff are very friendly, cater for age 5 - adult and all abilities. 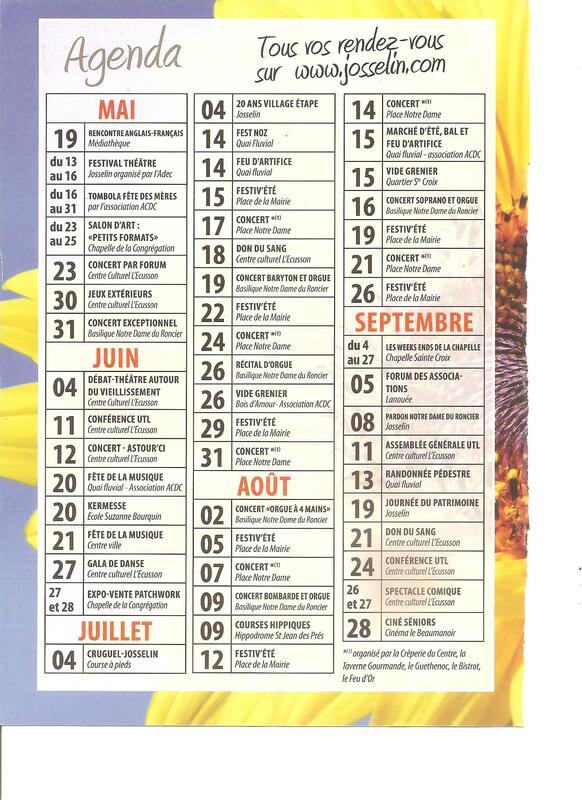 Loudeac also has a cultural season with concerts and other events taking place on the Quai des Reves. Lac de Guerledan is a vast stretch of water which offers water skiing, boat trips and swimming as well as walking and cycling routes around the lake as well as lovely walks along the Nantes/Brest Canal. Zooparc de Tregomeur – Tigers, bears and gorillas await your visit! Numerous beach resorts including Pleneuf Val Andre, Plerin, St Cast Le Guildo - all wonderful lively resorts with sandy beaches and wide promenades. Dinard - a lovely coastal town where you can walk down the cliffs and take the ferry to St Malo. Dinan –. Another beautifully preserved medieval city with steep cobbled streets leading down to the port area with its many restaurants, bars, art galleries and shops. Suggest no high heels!! St Malo – The famous walled city of St Malo is full of quaint streets, restaurants and bars. Many people think this is a medieval city but it has in fact been largely rebuilt since World War II. However, this is a fantastic place to visit and should not be missed. Cancale –Home of the oysters. Visit Cancale and enjoy washing down the fresh oysters with a glass of muscadet. Le Mont St Michel on the Normandy border is an iconic place to visit with its abbey perched on a rock in the sea. This again requires flat shoes and is a steep walk and please be aware that it is extremely busy at all times of the year but if you haven’t been before, it is a must and the soufflés are meant to be excellent.